I started my new job a few months ago and was setting up my 401(k). I still had a 401(k) with my previous employer and wasn’t sure what to do with it. You first want to determine what kinds of accounts you have in the old 401(k) and how much money you have in each account. For example, I had some money in a traditional 401(k), a Roth 401(k), and a taxable account all within the same 401(k). That’s three different types of 401(k) contributions within the same plan! This information will come in handy later as it is likely you’ll have to roll over each type of 401(k) account separately. It’s also important to note the balance in your 401(k) to determine how much time you have to decide what to do. Most 401(k) plans will let you keep the money in their plan even if you no longer work for the company as long as you have a balance over $10,000. If you have less than $10,000 in an account, after some time, they may send you a check for the balance of the account and you’ll pay taxes according to your tax bracket and the 10% penalty if you’re under 59 and a half. This happened to me with my first employer change because I delayed figuring out what to do with my money. I got a check in the mail for the balance of the account minus taxes and lost big time. If you do have over $10,000 in the plan, take a second and figure out the best move for you. Don’t wait too long though, especially if you’re not in a great plan. Leaving your employer is an opportunity to roll that money over into something more advantageous tax free (as long as you complete the rollover within 60 days of removing the money). Fees are no joke. Research has shown that even a fee of 1% can cost upwards of $590,000 over a 40 year investment period. Figuring out all of the fees in a 401(k) plan requires a bit of digging but is so worth it. Here are some helpful tips on how to find out what fees you’re paying in the 401(k) plans. Fund expense ratios will be disclosed in the prospectus which is a document that gives detailed information about the fund. Plan administration fees are usually listed in your plan’s summary annual report. Keep in mind that there could be new administration fees in your old plan that apply to you now that you’re no longer employed with the company. You can always call your plan administrators if you cannot find the information online or have questions about fees. Remember, you choose the funds in your 401(k) plans. Keep in mind that you can always switch to lower fee funds in your 401(k) plan. Most employees start out invested in target date funds (such as Freedom 2050) but it can be lucrative to switch to index funds. I personally invest in index funds, usually putting most of my 401(k) in a fund that tracks the S&P500 index (the index of the top 500 companies. I would choose to invest in a fund that tracks the Total Stock Market Index such as VTSAX if my 401(k) plans offered VTSAX but they haven’t yet. The S&P500 index fund is a close second and most 401(k) plans seem to offer it. From my research, I have found index funds to be the cheapest and most reliable option for me. When I’m deciding whether to keep my money in a plan or rollover to a different plan, I always check if the new plan offers low cost index funds. Many people think you only have two options when you leave your job – you can rollover your 401(k) to your new job or you can leave your old 401(k) the way it is. You actually have a THIRD option with the money that not many people know about and can be much more lucrative for you. You can roll the money over into an Individual Retirement Account or IRA for short. The awesome thing about this third option is that you can choose the IRA company based on who has the most competitive fees and fund offerings. The top companies for me right now are Betterment and Vanguard. I compared the fees from my former employer’s 401(k), my current employer’s 401(k), Vanguard, and Betterment. There was no comparison between my previous or current employer’s plans and Vanguard/Betterment in terms of fees. Fees in my old and new plans were above 1% for actively managed funds and at about .5% for passively managed funds such as index funds. While these fees are not too bad when you look at the whole industry, it was more than I wanted to spend and didn’t compare to low-fee Vanguard and Betterment. For this reason, I decided to move the money out of my old plan but not roll it over into my new plan. This doesn’t mean I’m not contributing money to my new employer’s plan though. I’m still contributing the max every year in both a 401(k) and an after tax account. I just don’t want to put any of my old money into the plan given the fees are higher than Betterment and Vanguard. 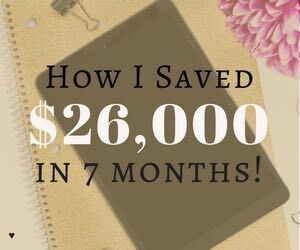 Read about how I saved $26,000 in 7 months by contributing to retirement accounts. Vanguard has the lowest fees but Betterment is a close second. In terms of fees, Vanguard was the winner at a .05% expense ratio for the Total Stock Market Index Fund (VTSAX). This fund requires a $10,000 minimum. If you don’t have $10,000 to rollover, VTSMX is another fund that Vanguard offers that has an expense ratio of .16%, which is a bit higher but still fantastic. Betterment had an extremely competitive fee offering as well and fees decrease significantly as your account balance increases, starting at .35% for balances under $10,000, .25% up to $100,000, and .15% over $100,000. Betterment also offers a superb online experience which is huge. Technology in financial companies can be super frustrating for the customer (I have experienced this both as a customer and from working in IT at a financial services company). Betterment is definitely a leap forward in the industry. Betterment beats Vanguard on ease of use, technology and customer service. 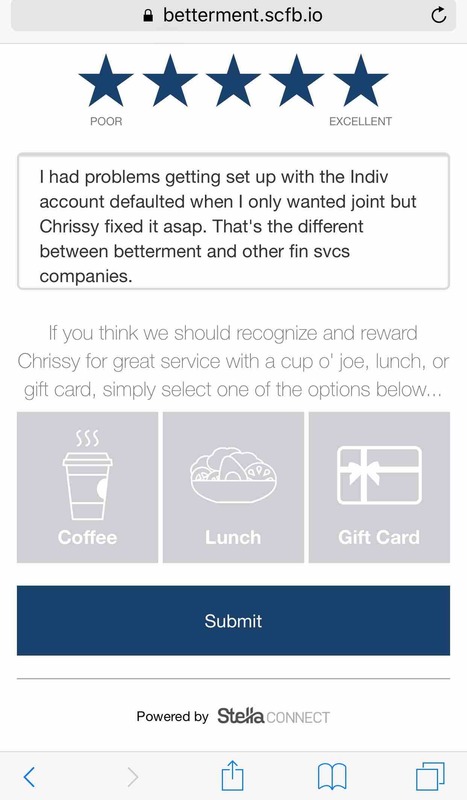 Betterment beats Vanguard in terms of customer service hands down. I have money in both Vanguard and Betterment and Vanguard has taken weeks to resolve some of my issues. For example, I had problems setting up my IRA due to a duplicate account issue that took 5 phone calls to resolve. I wasn’t able to complete my account online and had to send my paperwork via mail, only to be told that the account did go through online. It was a big mess that took weeks to resolve. I love Vanguard because the fees are so low but I have to admit that all the hoops I had to go through to get my account straightened out was annoying. The account with Betterment was ridiculously easy to set up. It took me 15 minutes end to end versus weeks with Vanguard. I did run into an issue with Betterment (I wanted to add my fiancé to my account but accidentally set up an individual account instead of a joint account) but that was resolved in five minutes via the online chat feature. Within twenty minutes I had opened an account, linked my bank account, set up an auto-deposit twice weekly, and was good to go. I also received this email which made me love Betterment more. I could buy the customer service rep who helped me out coffee, lunch, or a gift card. I thought that was a neat touch. Betterment is forward-thinking and easy to use, plus the fees are still super-low. I highly recommend setting up your IRA or even your regular taxable account with Betterment. Motif is another option for the tech-savvy and innovative investor. 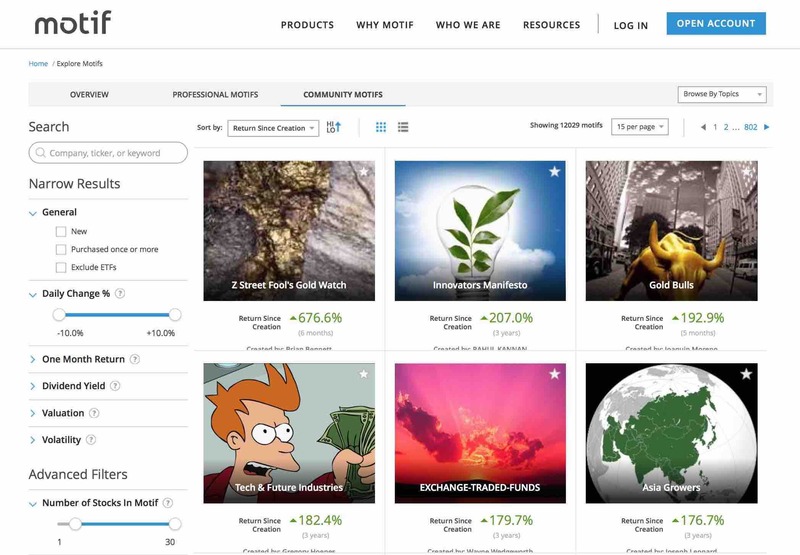 Another company to explore for rolling over your 401(k) is Motif. Motif offers collections of investments, an easy to use interface, and a cool $150 bonus for just signing up (I don’t hate free money). Motif is different from traditional investing though because you essentially choose a theme (called a motif) which is a collection of 30 stocks that fit into one category such as health & fitness, or housing. You can create your own themes too, if you wish, in any category that you want. There is a community feature where you can see top returning themes created by other users. The community aspect of Motif is pretty cool and appeals to the competitive side of me. 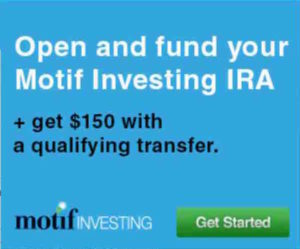 Motif is low cost too compared to traditional 401(k) plans with trade fees starting at $4.95. Motif is another option to consider when you’re deciding what to do with your old 401(k). Random edge cases to consider before rolling over your 401(k) to an IRA. Before you decide to move your money out of your previous employer’s plan based on fees and fund offerings, consider if you fall into an edge case. People in their late fifties who lost their job as well as those with a certain type of company stock may be be better off leaving their money in their previous plan according to this U.S. News article. At first I thought that you might want to leave your money in your old employer’s 401(k) plan if you wanted to do a Backdoor Roth eventually but I found out that taking your money out of an old 401(k) plan won’t close that door for you. I did not fall into an edge case so I decided to rollover the money. 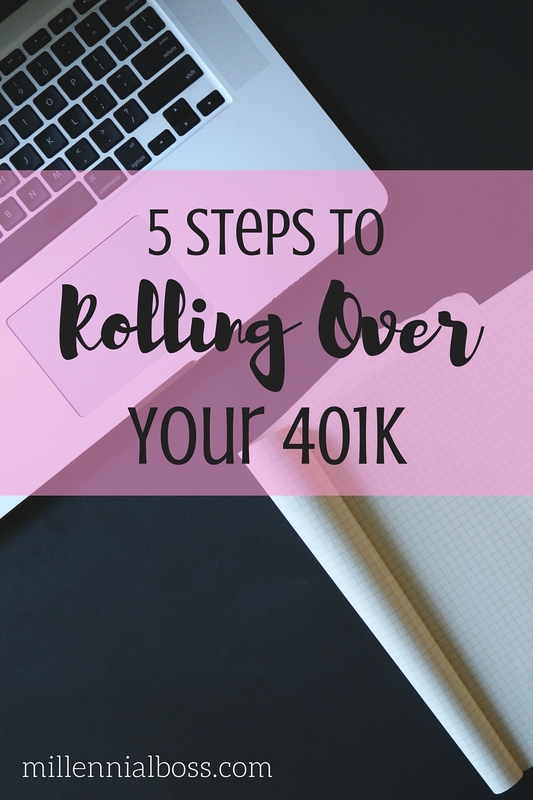 If you do decide to roll over your 401(k), you have steps to complete with both the old company and the new company. The Vanguard, Betterment, and Motif rollover process is well-documented online so if you go either of those routes it should be easier for you. 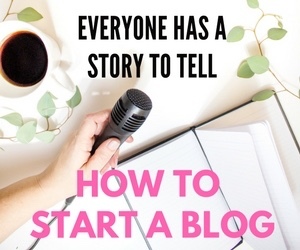 First, create an account with the new company (if you don’t already have one). Keep in mind that you might have to create multiple accounts for each type of account you’re rolling over. For example, you will have to create two separate accounts for before and after tax money if you have both a 401(k) and a Roth 401(k). Make sure you write down your new account numbers where you want the money to go as well as the name and address of the company holding your new accounts. You’ll need to provide that information to your old plan so they can put it on the checks. The next step is to contact your previous employer’s plan and initiate a rollover. Betterment contacts your old plan on your behalf which is convenient but if you don’t go that route, you’ll have to do it yourself. See if you can do the rollover online first. The transaction request is probably under the distribution/withdrawal section of your old plan’s website. If you can’t find what you need online, then call. Know that some plans will not rollover your money directly to the new accounts. They may send you checks for the balance of your accounts and then you mail those checks to the new company. It’s annoying but it’s protocol at many financial services companies. You might not be able to rollover the accounts all at once. I needed to wait almost another month to rollover the money I had in one of my old job’s retirement accounts since my plan only distributes those checks monthly. If you are personally mailing the checks to the new company, I recommend mailing with tracking numbers so they don’t get lost in transit and so you can provide the new company that tracking number to check in on status. Once the new company receives your funds, they often place those funds into a settlement account. You then choose what to do with that money. I personally recommend investing in index funds since so few money managers beat the market. To invest, choose the fund you want to invest in and “buy” that fund. Be aware of minimum balances you need to buy into certain funds such as the $10,000 minimum to buy the VTSAX fund with Vanguard. If you go with a robo-advisor such as Betterment, they will choose the funds for you based on your goals. You may have completed your rollover but your work is not done. Now that you have these new accounts created, you can start contributing to them right away. Link your bank account and set up direct deposit to continue to grow your savings. Bonus! – Keep investing after you complete the rollover. After I rolled over my 401(k) into an IRA, I put an additional $5,500 cash into the account. $5,500 is the maximum you can contribute to an IRA per year. The money you rolled over does not count towards that annual IRA contribution limit. There is no cap on taxable accounts so you might as well keep that money flowing in too. I currently contribute 10% of my paycheck to taxable accounts and plan to contribute more once I sell my house. 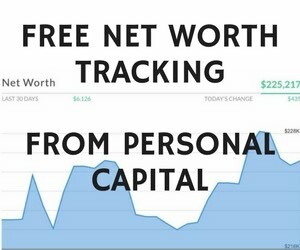 The best way to build wealth quickly is to automate your savings. Set it and forget it. Have you ever rolled over your 401(k)? What did you decide to do with the money? Awesome tip on not lagging on deciding where to roll your funds. I did not know they could just cut a check out to you minus the taxes and 10% earl distribution fees if your balance is under $10k. That’s a huge loss. Good route on rolling it over to an IRA. 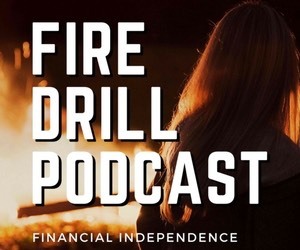 Since you mentioned interest in real estate at some point, I think another good option to consider is rolling it into a self-directed IRA instead of a traditional IRA. With a self-directed IRA, you have more options to choose what investments you want to put your money into. Your self-directed IRA can actually buy rental properties, invest in notes, precious metals, etc instead of just stocks and bonds typically available in the traditional IRA. Just something to consider down the road. Great point about the self-directed IRA. I’ll have to investigate that option. I am interested in getting into rental properties down the road! Both Ms. Financial Slacker and I rolled prior company 401(k)s into IRAs. I felt that once I left the company, I wanted more choice and having the money in an IRA gave me more investment options. I actually rolled a portion into a self-directed IRA as well. These are a little trickier, but allowed me to invest in a real estate venture fund that paid a better return than I could get in more traditional stocks, bonds, and funds. So I am hearing about the self-directed IRA! Thanks for the tip. I’m currently selling a house now but I may jump into rental properties later on. I think it’s safe to say that it almost always makes sense to roll money out of a 401k and into an IRA. Most 401k plans are limited in options and have high fees. I do this whenever I change jobs. I send the money to either my Schwab or Interactive Brokers accounts. As a dividend investor, I don’t use Betterment or Motif. I like both services, but I want to be able to buy an control my own destiny with individual stocks. Motif allows buying individual stock, but doesn’t offer DRIP investing. Except in those edge cases I mentioned in the U.S. News article such as someone who is in their fifties. Besides those situations though, yes, totally agree unless you have the 401(k) deal of a lifetime. The biggest reason that I rolled over my 401k accounts is now I have fewer accounts I need to keep track of. For awhile, I had 3 401ks our there and my wife had 2. Just too many accounts to worry about. Now we each have an IRA and a 401k and life is simpler again! Comparing the Robo-advisor fees with Vanguard is a bit like comparing apples and oranges. With Betterment you still have the hidden expense ratios of the underlying ETFs (0.05%-0.20%) on top of the Betterment management fee (0.15%-0.35%, depending on account size). 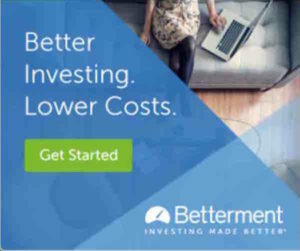 If you want to save the 0.15-0.35% with Betterment, you can just pick the Betterment portfolio weights and replicate whose with the appropriate Vanguard Mutual Funds. I have 4 accounts in 4 different places (Old 401K, Roth IRA, SEP IRA Money Market, Traditional IRA). My wife also has a Roth IRA account. I am thinking it would be a good idea to move those to Vanguard. Too many accounts and high fees. Planning on putting the money in VTSAX & VBTLX. 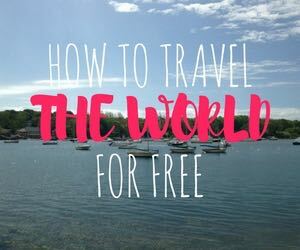 Great move to get away from fees!